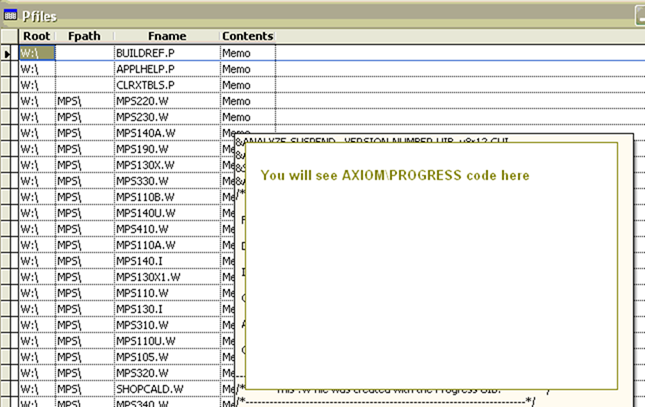 The AXIOM/Progress database is an industrial-strength database with many positive attributes. Easy accessibility to the data is not one of them. TART allows us the ability to periodically replicate whatever fraction of the database we desire and export the data into Excel, text files and DBF files. TART also solves another vexing AXIOM problem. When you are building a report, there are times when you just can't find where AXIOM is storing a particular data field. AXIOM does some clever things with the compression of multiple data fields into one by the use of "pipes" (the symbol "|"). As a result, it is not always clear where something is being stored. After replication, TART will search the entire replicated data bases (axs, cis,fin mdw) for a particular data string so one can pinpoint where it is being stored. TART now comes in two "flavors". TART Version 2 works as well as it always has. TART Version 2 is written in Microsoft's Visual FoxPro. Microsoft has chosen to stop developing FoxPro and will stop support in 2014. 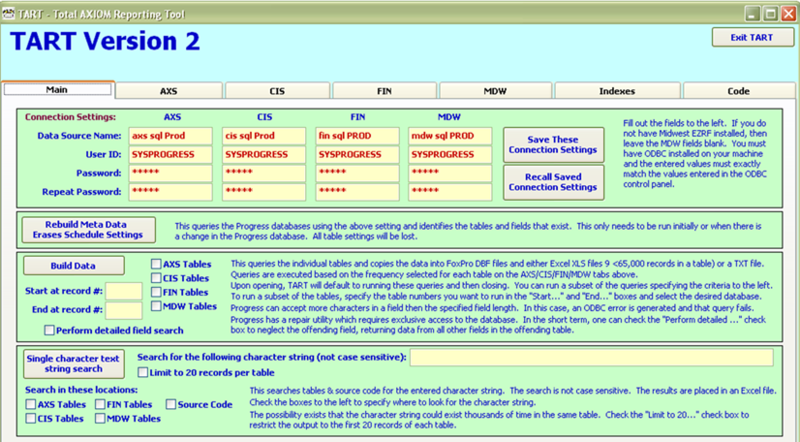 TART Version 3 is Excel 2007 based and replicates the Progress tables in SQL Server and Excel 2007 files. Excel 2007 supports over 1 million records so almost all of the AXIOM tables can fit. Also, TART 2 allows the user to selectively chose what fields in what tables are to be replicated in SQL Server, thus minimizing processing time. TART Version 3.0 places all Progress tables into one SQL Server database, eliminating the problems created by the current AXIOM structure of 3 separate databases (axs, cis, fin). The cis.mfg-invh table is a particularly valuable table that contains millions of records and is sparcely indexed. It is very difficult to extract information from this table in a timely manner if the information desired cannot take advantage of the mfg-invh or mfg-invx indexes. TART Version 3 includes a dedicated mfg-invh updater program that extracts only "yesterday's" transactions and appends them to the SQL Server replicated copy of mfg-invh. Once there, other SMART programs can use this replicated data in a properly indexed table and extract information in seconds instead of hours. Also, the companion CodeFiler software collects all of the AXIOM/Progress code into one Visual FoxPro (VFP) table for easy searching of character strings there. This solves a similar problem of trying to locate what information on an AXIOM screen matches with a field in a Progress table. CodeFiler is scheduled to be folded into TART to result in one utility that can search both the data and/or the code for desired text strings. TART Version 3 is under rapid development. The rest of this document discusses features of TART Version 2, which is a fully mature product. Ignoring this message will allow TART to begin automatic replication of the selected AXIOM/Progress tables. 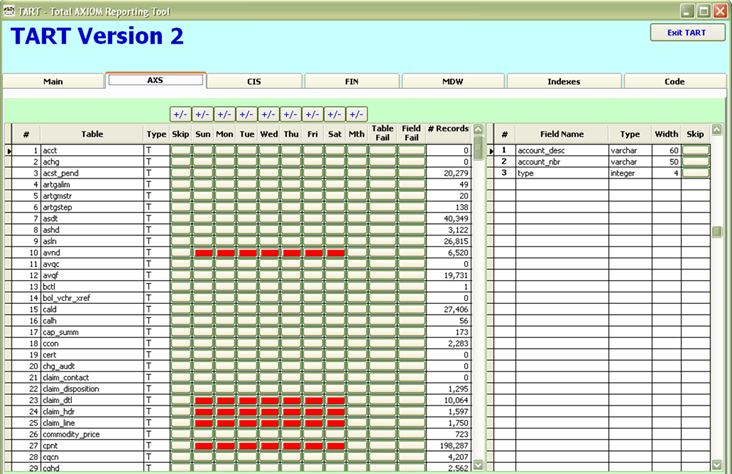 The 4 database screens allow the user to specify what tables and fields are desired, and at what frequency (daily, weekly, monthly updates). Simply turn the appropriate button red by clicking on it to enable that choice.